It was my turn to decide where My Kitchen, My World was going to travel this week. The choices were endless. Where to go? Russia? Nope. Bad experience at a Russian Banquet back in college. Germany? France? Korea? Japan. Hmmm. Nope. This week we're going to Argentina. Sounded like a good plan. I did have to chuckle when I realized that beef-deprived dh had suggested the country with the highest per capita consumption of beef in the world. Did you know these facts about Argentina? The Driest place on earth is the Atacama Desert, in Argentina. It's a place with virtually no vegetation; in some parts of Atacama Desert, it has never rained! The highest peak of South America, Aconcagua, is in Argentina. It is 22,834 feet high. Argentina is the largest Spanish-speaking country of South America. While dh had been dreaming of steak, I opted for a more family-friendly (as well as budget-friendly) opt ion: Argentine-Style Burgers. Flavored with onion, garlic and jalapeno, the burgers were moist and flavorful without being too spicy. Dh was disappointed that they weren't plain but I much preferred these. And while dh and the kids avoided the chimichurri sauce, I really enjoyed it and can't wait to find other ways to use it! While I was Googling to find the recipe again, I found that one of my favorite bloggers had also blogged about these. Go check out what Elle had to say about her experience with Argentine-Style Burgers over at Elle's New England Kitchen. I'm so jealous of her homemade pita bread! It looks delicious. In a medium skillet, heat 1 Tbs. of the oil over medium heat. Add the onion, garlic, jalapeño, and 1/4 tsp. salt. Cook, stirring occasionally, until softened, about 3 min. Transfer to a medium bowl, let cool for 10 min., and then add the ground beef, cumin, oregano, cilantro, 1 tsp. salt, and several grinds of pepper. Mix gently with your hands until just combined. Shape the meat into four burgers, 3/4 inch thick and 4 inches across, working the meat as little as possible. Make a 1/4-inch dent in the center of each burger with the tips of your middle three fingers. Put a large skillet or griddle, preferably cast iron, over high heat and let it get very hot, about 2 min. (The pan is hot enough when a drop of water evaporates instantly.) Add the remaining 1 Tbs. oil and tilt the pan to spread it evenly. Arrange the burgers so there’s as much space as possible between them, reduce the heat to medium high, and cook, uncovered, for 5 min. Turn and cook until the burger feels springy but not mushy when poked, about 3 min. for medium rare (or longer if you’re concerned about undercooked meat). Charcoal: Prepare a medium-hot fire. Cook the burgers, uncovered, on one side for 5 minutes. Turn and cook until the burgers feel springy but not mushy when poked, another 4 to 5 minutes for medium rare. Gas: Heat the grill to high. When the interior temperature is about 500°F, cook the burgers for 3 minutes with the lid closed. Turn, close the lid, and cook until the burgers feel springy but not mushy when poked, another 3 to 4 minutes for medium rare. Cut the top inch or so off the pitas to open up the pockets wide enough to fit the burgers. Serve the burgers in the pita with red onion and lettuce, if using, and some of the chimichurri sauce. Great idea! The burgers sound awesome. You guys are making me hungry for chimichurri. a great twist on an authentic dish. very creative. Chimichurri is a great sauce. I like to use it on fish too! Those look fantastic. I love a good burger! Thanks for picking such a fun country. I had a blast picking out a recipe. 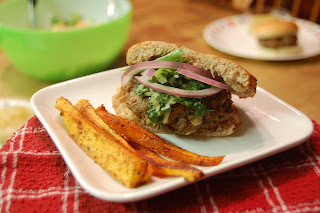 great idea to do burgers- I must remember this because I loved the chimichurri I made. Thanks for a great country pick. Thank you for choosing Argentina for our culinary journey. I apologize for being late, but I think is better to be late then never.